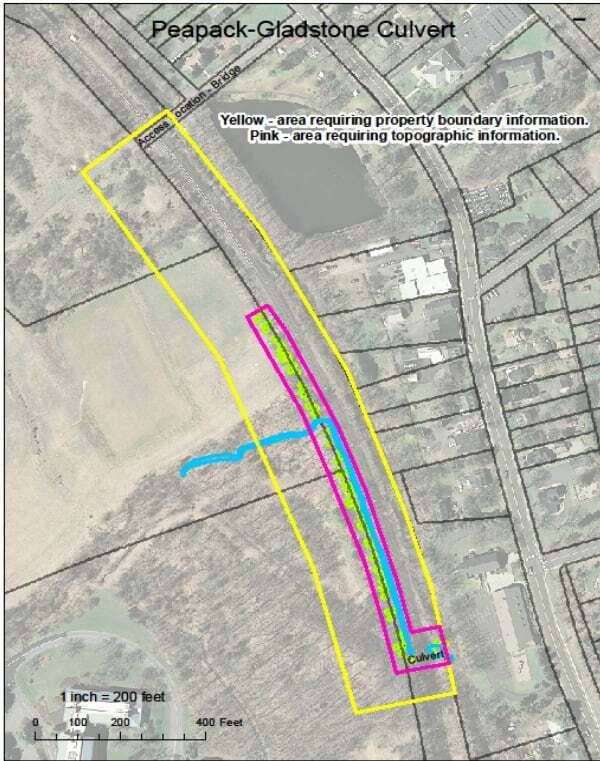 Right of Way – to properly assess the requirements for the preliminary design and stay within the existing available NJ Transit property, the survey and mapping were completed under this initial phase. It allowed AmerCom to accurately research and establish existing property lines based on field survey data as required by the NJ Map Filing Law. A thorough document search of deeds and available file maps was conducted to accurately determine current owners and locations of property lines within a 250 foot radius at each bridge site to establish the ROW as well as any previously recorded easements or encumbrances. Establish Horizontal and Vertical Controls – AmerCom’s survey crew established horizontal & vertical control points using Global Positioning System (GPS) satellite receivers to produce an accurate survey control network through the project limits. Project controls referenced the National Geodetic Datum of 1983 for horizontal control and the 1988 National Geodetic Vertical Datum for vertical control. Two control coordinate monuments outside the anticipated limits of construction at each bridge were established through the use of GPS for ease of recovery in the future. A control traverse and benchmarks were established through the project limits through ground survey. All traverse points and benchmarks had three point ties to surrounding features so they can be easily reestablished during construction. Topographic Survey – The existing topographic features were surveyed including all topography and contours extending 250 feet along the tracks at each bridge site; the rail lines; the ends of the high level platforms and extending 25’ on either side of the centerline of track and the centerlines of the streets. Digital Terrain Modeling Procedures (DTM) were used in the data collection process. Base mapping was prepared one-inch equals 30 feet scale with one foot contours generated to represent true elevations above mean sea level and the exact shape of the ground. The contour lines were shown as solid lines and labeled. Spot elevations were provided at key points. The mapping band widths are 50± feet centered on the railway centerline and along the R.O.W. of the streets. In accordance with NJ Transit’s CAD requirements, all features were separated into the CAD layers with the appropriate symbols and line types. To limit impacts to the tracks and increase the safety of the field crew, reflectorless total stations were utilized to survey the rail profiles. This equipment has the same accuracy as standard survey work using total stations and reflectors but results in the safest and least interruptive method for surveying rail facilities since all work can be completed without fouling the tracks. AmerCom personnel attended NJ Transit’s safety class prior to any of the field work. Field Edit and Survey Report – A field edit was performed after the base mapping was completed. A survey report was prepared and submitted in order to provide official documentation of the survey and serve as a convenient future reference during and after construction. The report contains: details of all survey methodologies, closures, ties, point coordinates and property information found; a copy of all field survey notes; Microstation drawings; an existing conditions plan signed and sealed by a NJPLS showing the survey point locations for all features conventionally surveyed; tables of control data including bench marks and horizontal control stations. Two signed and sealed survey control reports were also produced. Utility Investigation – AmerCom performed overhead and subsurface utility investigations by contacting known utility providers. Utility companies were requested to mark existing facilities on the preliminary basemap and returned to AmerCom. All information was then compiled into a revised basemap. No test pits for utility locations were performed. Inverts and pipe sizes of drainage structures and sanitary sewers within the project limits were also added to the basemap. 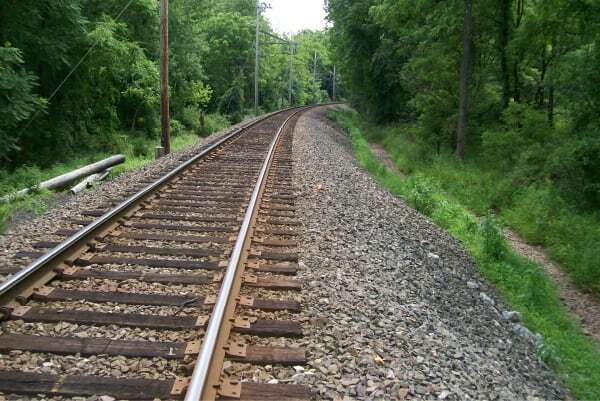 Track Profiles/Cross Sections – Cross sections of the existing rails at 50-foot intervals for the entire project limits were obtained. Cross Sections of the approach roadways were obtained at similar intervals within 250’ on either side of each bridge. The cross section width was limited to 25 feet either side of track centerline. During the survey services Safety flagging personnel were provided by NJ Transit and necessary entry permits and/or notices were communicated between AmerCom and NJT personnel. Supplemental Survey – A supplemental survey was conducted for preliminary maintenance and protection of traffic requirements such as traffic detours and potential bridge “roll in” requirements.